How to keep abreast of your company on customer service concept? 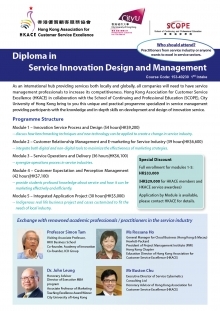 HKACE is here to present you the Service Innovation Design and Management Program. Members can enjoy special offers! Don’t miss this precious chance for you to explore yourself! The GDSEL program aims to provide a high-standard landmark model of a knowledge development program for service industry practitioners. It is designed to equip senior managers / executives with the necessary strategic orientations; services marketing and management strategies; operational tools and leadership skills to develop sustainable service excellence and high performance in their organization.